Bill McLean at IC Insights has released his forecast of the top 10 fastest-growing products for 2006, and leading the way is the lowly comparator, with a stunning 37% growth. All the figures show that this was a good year, especially if you were in analogue devices, with 5 out of ten, and even for DRAM. The DRAM market is forecast to jump 27%, and rank #3 in the survey. This follows a 5% fall in 2005. Two other memory segments, EEPROM/Other (#4, 25%) and ROM (#6, 22%), are expected to grow surprisingly well. IC Insights believes that new video games and gaming consoles such as the PS3 and Xbox 360 contributed to some of the forecast growth. 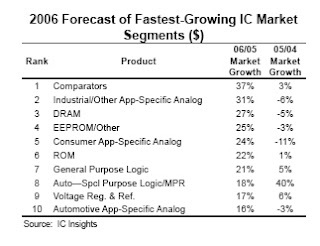 In total, 18 product categories area forecast to outpace the 8% growth of the total IC market in 2006, another 5 categories are expected to show positive but slower growth than the overall IC market, and 7 product categories are forecast to show negative market growth. So this was a good year - remember that! It didn't feel too much like the top of the cycle, but here's to continuing growth in 2007!